I do not have any form of a coffee machine. The closest is a kettle… I have tried to use strong/good quality instant coffee, filling half a cup then hot boiled milk in the other half. It just tasted like coffee. So how do I make a cappuccino at home without all the fancy tools? Do you have a French press? If so, you can make coffee that is quite strong in there and you can froth your milk. For the coffee, grind it course. If it's too fine, too much will go through the mesh and your coffee will be murky and over extracted. Buy a very dark roast, but something that isn't too smoky. Italian roast is too smoky. Espresso beans typically have more of a caramelized flavor vs. smoky. For the milk, warm it a little more than you want for your cappuccino. Put it in the clean press. Vigorously pump the plunger up and down. This will make luscious, dense foam. If there are too many large bubbles pump longer, or you can stir it a little. I don't love specialized or expensive equipment either. French presses are inexpensive and useful for steeping many things. They are also small, and you can use them when you are away from electricity (camping/zombie apocalypse/etc). This isn't no fancy tools, but it is no expensive fancy tools and the results are pretty darn authentic. A cheap battery-powered hand frother. 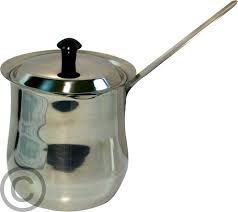 Any kind of metal container to heat and froth the milk on a stove. A small saucepan would do, but I find a little pot like the third pic below more convenient, and the shape seems to help with the frothing. Probably, a second mug or a small jug in a microwave would work too, though I've not tried that. Make a shot or two of coffee the normal way in the moka pot on a stove burner. On another stove burner, heat the milk. 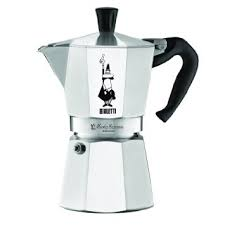 I find that if I start preparing the milk after setting up the moka pot, they're both ready at around the same time. Pour the frothed milk on top, using a teaspoon to get any stubborn froth that doesn't want to come out. The hot milk will mix, the foam will stay on top. I'm no coffee connoisseur but to me it tastes almost the same as a cappuccino from a coffee shop. Well, if you want to make the Viennese original, all you do is combine coffee and sweetened cream, the latter possibly whipped. The coffee can be brewed however you wish, although instant is probably not entirely authentic. :) You can add cinnamon and/or shaved chocolate, if desired. If you want to make the modern definition of cappuccino, it's based on espresso coffee, which, despite all those labels on coffee packages, is not a particular grind, roast, or variety of coffee bean. Instead, it's a particular brewing method, and one that you're not going to reproduce without the specific equipment. However, there's a pretty close substitute available in the form of instant espresso granules. Unfortunately, that still leaves the steamed milk, which again, you're not going to reproduce without the specialized equipment of a steam wand or a milk frother. You can get sorta-kinda close-ish by scalding milk and then whirring it in a blender at the highest speed you can manage. (A food processor won't work, it has to be a blender.) Careful you don't end up scalding yourself as well as the milk! You can also use whipped cream instead of the steamed milk, but then you might as well call it a Viennese coffee. The third option is to buy a cappuccino mix - a couple years back there was a brand that advertised itself by having a woman make espresso-machine noises in the kitchen while she simply poured hot water over the mix, after which her friends remarked, "We didn't know you have an espresso machine". I don't know how those mixes get the foam to develop, and I probably don't want to know. I've had success with making milk foam using a mason jar. Put a cup of milk (whole, skim, 2%, whichever you prefer) in the jar and close it tightly. Shake the jar vigorously until you have the amount of foam you want. Immediately place the jar in a microwave (removing the metal cap) and cook for 30 seconds on high. Now you can scoop the foam out with a spoon and pour the warm milk out of the jar. It may not be authentic, but it is sufficient for a home-made cappuccino and requires no extra tools! You need something to froth the milk. You can't really do it without some sort of specialist tools but there are some cheap handheld things (e.g. battery-powered whisks - which don't work very well; hand-pumped frothers which look rather like a cafetiere - I've never tried one). 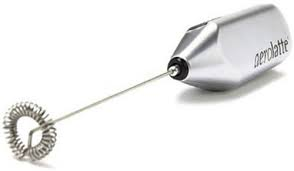 "Milk frother" looks like a good search term. You're not going to get an authentic cappuccino flavour with instant coffee, but if you insist on using instant or have no option, try instant espresso powder. Cappuccino should be 1/3 espresso, 1/3 hot milk and 1/3 foam. Ideally the foam is made and the milk heated by pushing steam through the milk. You can, somewhat surprisingly, froth milk with a (clean) French press (aka Cafetière) too (OP says he/she has a French press). So much so that some friends who drink milk in coffee (I don't) have miniature French presses for this purpose. Simply heat a small amount of milk (if you can remove the glass from your French press, microwave it in that), sufficient to fill about a third of the glass, then rapidly plunge and withdraw the plunger, repeating many times. Frothy milk results. You of course also need to make the coffee. A French press can be used for that too. Not the answer you're looking for? Browse other questions tagged coffee foam or ask your own question. How to make a cappuccino not overflow?